60% cotton / 40% funnel neck top in loose knit, heathered, light brown French terry fleece. Screenprinted UMD script graphics are subtly accented in silver. Functional, low profile front pouch pocket. Self cuffs and waistband with side split hem. This cozy top makes a great layering piece. Tag at neckline. 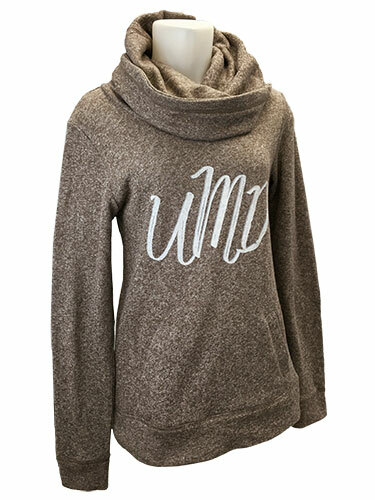 Please select option for Women's UMD Cowl Neck by Gear.